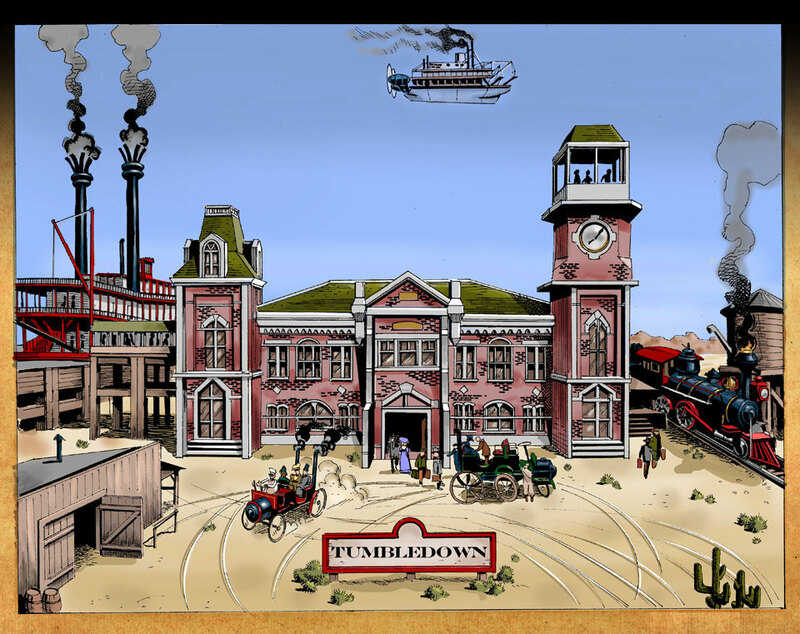 Transition, as the CLOUD QUEEN comes in to port alongside a train station in the middle of desert plains, the town of of Tumbledown. I’m imagining the train station with, on one side, the tracks, and the other with an elevated platform for the sky boats. Early morning. Not too busy. A STEAM ENGINE belching at the station, perhaps. DRAKE, DRUM, and JOHNS coming off the platform. DRAKE has a hand on JOHNS’ arm, DRUM following behind. JOHNS looking around. 2. DRAKE: What it says on the sign. Angle, past a GUNMAN, watching from around the corner of a building as DRAKE, JOHNS, and DRUM come into view. 3. JOHNS: Don’t suppose you boys’d consider letting me walk? 4. JOHNS: Got a stake that would make it mighty worth your while. Angle along the main street of Tumbledown. 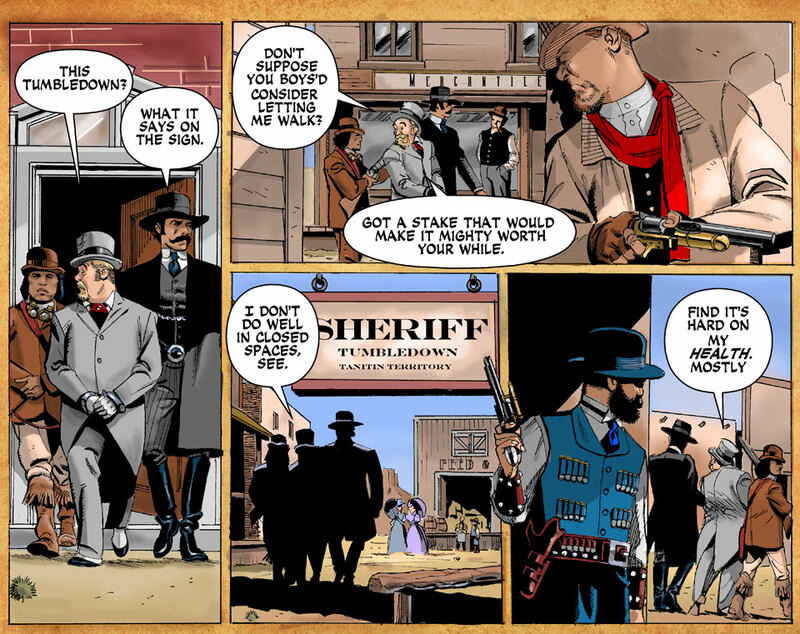 SHERIFF’S OFFICE sign in the FG, as DRAKE, DRUM, and JOHNS make their way towards it. There’s some activity in the town, people watching, moving around. Tension rising. 5. JOHNS: I don’t do well in closed spaces, see. New angle, past ANOTHER GUNMAN, watching DRAKE, DRUM, and JOHNS. JOHNS is looking around, nervous. 6. JOHNS: Find it’s hard on my HEALTH, mostly. Steampunk is usually so Victorian English in flavor, it’s cool to see this American West take on it. Foul play is afoot! Love the detail and that first panel, and the costume design continues to be stellar. I’m also really digging the weapons! Looks like theys fixin to be some shootin, pard.